Summer Berry Picking in and around Cincinnati | The Food Hussy! Summer is just officially around the corner and the summer fruits are blooming all over the place! And I love to pick seasonal fruit and find fun ways to use it! 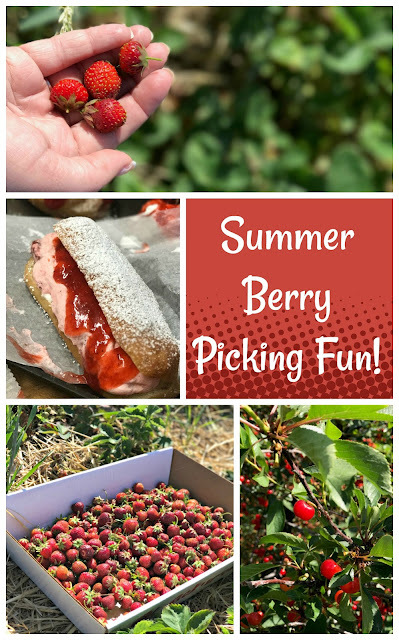 So let's explore some of the fun places around Cincinnati you can pick fruit now and all through the summer! There are farms all over the area that have strawberries, raspberries, blueberries, apples and peaches - which I will be taking advantage of all summer long. First up - I headed to Barrett's Strawberry Farm - Leesburg, OH for strawberry picking. Now unfortunately this weekend was the last for strawberries. So to visit them - you'll need to put it on your calendar for next year. They're usually blooming and ready around Memorial Day. Barrett's has four different varieties that range from small to large and various levels of juiciness. They stagger the berries over their farm acreage from year to year and there's definitely plenty of room for picking. The darker the berry - the sweeter the juice - just fyi. Even though the season is ending - we were able to find a bunch of smaller ripe berries - which are great for jams and sauces. They're not the big "dipping" strawberries but they're actually sweeter and juicier! Next up - we visited Karnes Orchard in Hillsboro. Karnes has tart cherries, peaches, apples and pumpkins/gourds throughout the summer. After picking - I headed to Batter Up Bakery with the owner Casey and she was going to show me a few of the amazing and delicious treats she makes with all this amazing summer fruit! Strawberry season is one of her favorites and she uses the fruit in everything from fritters to long johns to "cinnamon" rolls to cake and everything in between. It's amazing - when you visit during Strawberry season - the top row is literally strawberry filled!!! 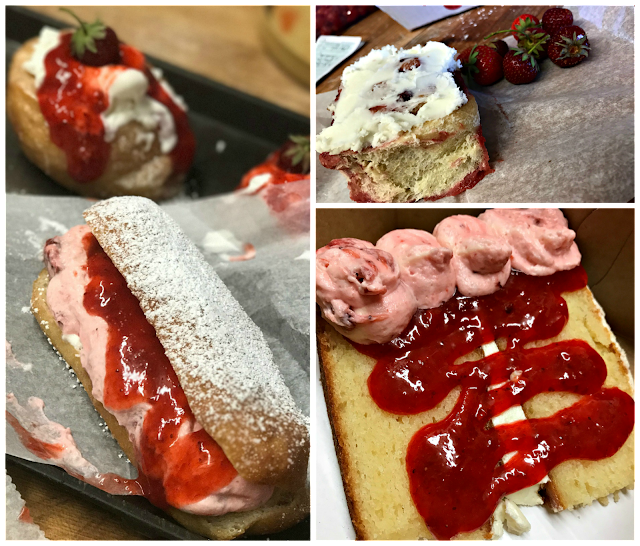 And - while the picking is done for the summer - you can still get strawberry treats at Batter Up Bakery for the rest of this week!!! So eat up! And I will say - that cake was AMAZING!!!!! Raspberries are up next and I'll be heading to Stokes Berry Farm in Wilmington for those! They'll be ripe in mid-June so that is basically this weekend! 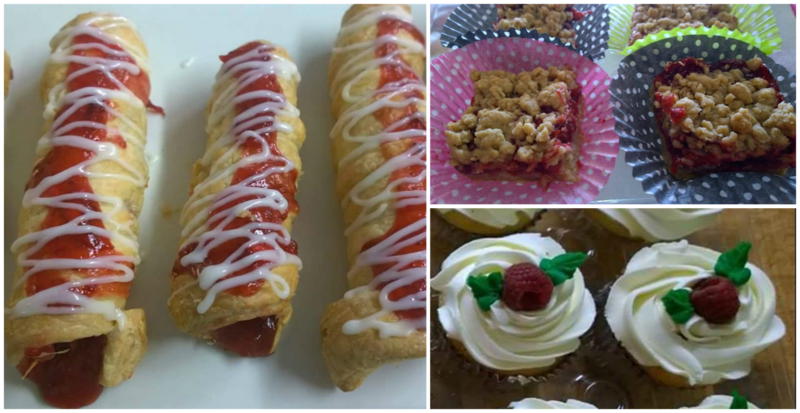 Batter Up Bakery will transition right from strawberries to raspberries and you can see some of the delights that they'll be making for the few weeks we have raspberries! Side note: Stokes Berry Farm still has strawberries for another week or two! Next up after the raspberries, will be my personal favorite, BLUEBERRIES!!! I'm seriously a blueberry addict. 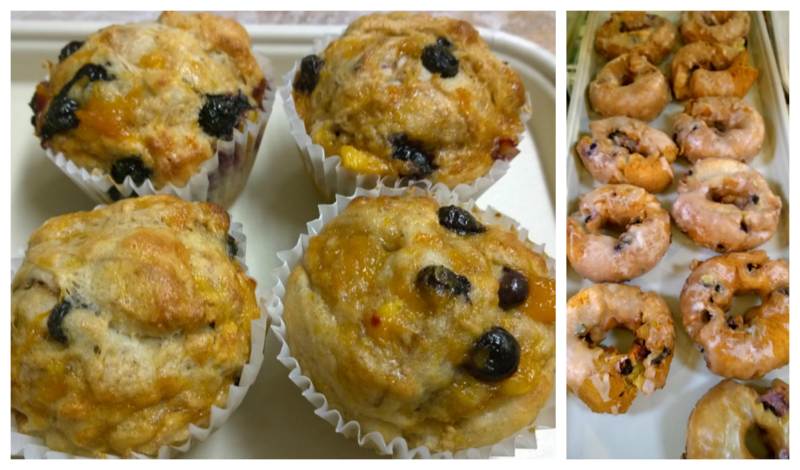 Casey recommended I head to Levo Century Blueberry Farm in New Vienna. Now a "century farm" means it's been owned by the same family for 100 years - THAT is impressive. Now if you want to pick your own - there are options! Check the Pick Your Own site for your area - here's a link to the Cincinnati/Dayton area. There are other options around the area. Later this summer - apples and peaches will also be available and yes - we will have peaches this year because we didn't really get below freezing over the winter! Woohoo! That means - fresh peaches for Mom's Peach Cobbler! And if you're in Clinton, Fayette or Highland county - you can sign up to be a shareholder in their Farm Boxes and get a box of fresh vegetables and baked goods every week through October! You can find out more from County Line Farm. So there you have it - a summer full of fresh produce - all grown and sourced locally! Plus - if you want to skip the picking and just get the treats - head to Batter Up Bakery in Leesburg - it's about 45 minutes north of 275 but it is WORTH the drive. And - if you have any egg-allergies in your house like I do - you can special order egg-free cupcakes (seen above) and they are delicious!